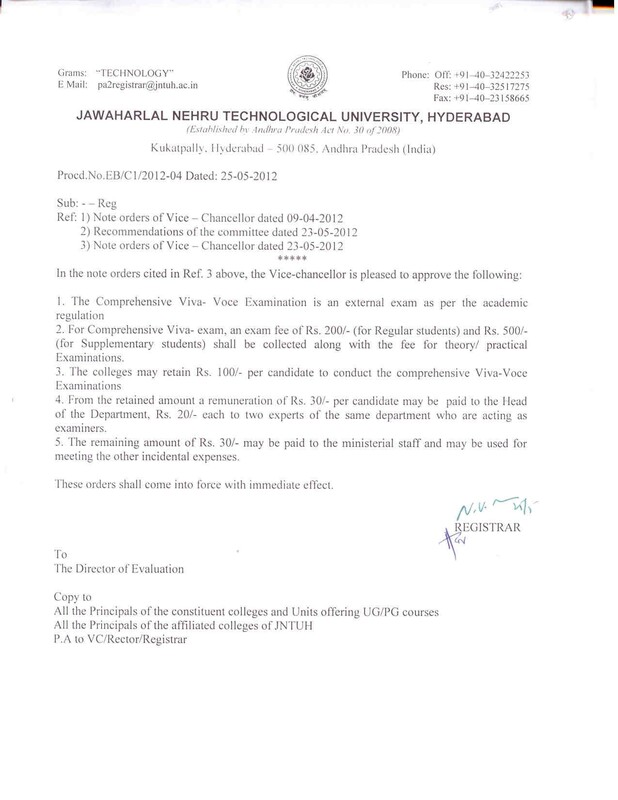 1) The Comprehensive Viva- Voce Examination is an external exam as per academic regulation. 2) For Comprehensive Viva-exam, an exam fee of Rs.200/- (For regular students) and Rs.500/- (For Supplementary students) shall be collected along with the fee for theory/practical examinations. 3) The colleges may retain Rs.100/- per candidate to conduct the Comprehensive Viva-Voce Examinations. 4) From the retained amount a remuneration of Rs.30/- per candidate may be paid to the Head of the Department , Rs.20/-each to two experts of the same department who are acting as examiners. 5) The remaining amount of Rs.30/- may be paid to the ministerial staff and may be used for meeting the other incidental expenses. These order shall come into force with immediate effect.